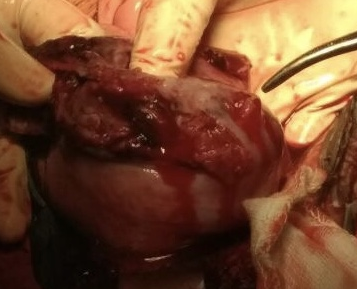 Rupture of a pregnant uterus is a rare and catastrophic obstetrical complication. Its incidence is higher in patients with previous scar on uterus but it can also be present in patients with unscarred uterus. It leads to higher maternal and perinatal morbidity and mortality. Here we present a case of a 27 year old woman G3P1L1MTP1 with 19 weeks of pregnancy with previous normal delivery with full thickness uterine rupture at the fundus with en sac fetus lying in the abdominal cavity. The placenta was attached to the serosa of the uterine fundus. Around 1.2 liters of hemoperitoneum was drained and 600 grams of clots were evacuated. Subtotal hysterectomy was done with successful outcome. Histopathology revealed placenta percreta and her post-operative recovery was uneventful. Rupture uterus is a life threatening obstetric complication which must be treated promptly. It is an uncommon occurrence. When compared with general population; patients with previous scar have a higher incidence of uterine rupture especially those with a vertical, T or J shaped uterine scars. Patients without prior cesarean scars but with previous surgical procedures like removal of fibroids, curettage, previous abortions; excessive use of uterotonics, prolonged labor, with a big size baby can also lead to rupture uterus. Spontaneous rupture of an unscarred uterus` is rare. Rupture uterus may involve adjacent organs mainly the urinary bladder which is an acute obstetric emergency. A 27 year old woman G3P1L1MTP1 with 19 weeks of pregnancy with previous normal delivery was referred from a private hospital with chief complaints of pain in abdomen since 1 day, breathlessness (NYHA Grade 2) and vomiting since two hours with septic shock with acidosis with suspected concealed abruption with severe anemia. She had a history of a full term normal delivery of a female child 3 years back and also a medical termination of pregnancy at 2 and a half months with uterine curettage done 1 and a half year back. She had a cervical cerclage done 1 month back. No medical records of the same were available. On admission her general condition was moderate to poor, peripheral pulses were feeble, tachycardia and tachypnea were present. Blood pressure was 100/60 mm of Hg. Her per abdomen findings were normal and uterus was 20 weeks in size corresponding to gestation age. On per vaginal examination os was closed and cervical knot was felt. Clear urine around 200 cc was in the urine bag. On admission her hemoglobin was 3.9 gm%, WBC count was 24000/ cmm, platelet count of 1.2 lakh/ mm3, INR was 1.2, aPTT test was 26 second with a control of 32 seconds. Her ultrasound (USG) was suggestive of liver parenchymal disease, IUFD and moderate hemoperitonuem. Hemoperitoneum was confirmed on USG guided abdominal tapping. Knots of cervical cerclage were cut and removed; no active bleeding occurred. CT scan of the abdomen and pelvis on surgeons recommendations was done to know the definitive cause of haemoperitoneum. It was suggestive of IUFD and suspected blush from the left uterine artery and hemoperitoneum. Consent for Exploratory laparotomy and obstetric hysterectomy (if needed) was taken from the patient after adequate information and counseling. Intra-operative findings showed a full thickness uterine rupture at the fundus. Fetus en sac was lying in the abdominal cavity but was attached to the placenta that was attached to the serosa of the uterine fundus. Placenta seemed to be invading the serosa of the fundus of the uterus suggestive of rupture uterus with placenta percreta. 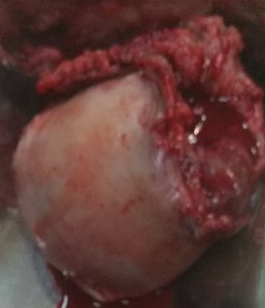 Subtotal obstetric hysterectomy was done as uterine repair was not possible. Around 1.2 liters of hemoperitoneum was drained and 600 grams of clots were evacuated. She was transfused with a total of 5 units of whole blood and 9 units of fresh frozen plasma. DIC profile was normal post correction. She was monitored in an ICU setup where she was successfully extubated. Her rest of the postoperative hospital stay was uneventful. Histopathology report showed chorionic villi invading the myometrium through the serosa consistent with diagnosis of placenta percreta. She was discharged on day 10 of surgery. Figure 1. Operative findings - the fundus of the uterus shows the site of the rupture. Figure 2. Specimen of subtotal hysterectomy - fundal rupture of the uterus and placenta extruding from the uterine rent are seen. Rupture uterus is a rare entity. It has a significant effect on reproductive function of women. The clinical presentation of rupture uterus include abdominal pain, vaginal bleeding, and maternal shock. Uterine rupture in a term patient can lead to non-reassuring fetal heart rate, loss of presenting part on pelvic examination, loss of uterine contraction. The risk factors include multiparity, uterotonic drugs, placenta percreta , cephalopelvic disproportions, malposition and malpresentations. Scarred uterus following operations such as cesarean section, myomectomy have a higher incidence of rupture uterus. Other procedures such as curettage, instrumental delivery, perforation of uterus during abortions also have a higher incidence of rupture uterus with placenta percreta. Placenta percreta is the rarest form of placenta accreta. Placenta percreta is rare and life threatening complication of pregnancy hazardous, for both the mother and the fetus. Placenta percreta is a state in which the chorionic villi completely penetrates the uterus and adjacent structures such as urinary bladder and bowel. Placenta percreta leading to spontaneous rupture of uterus in early pregnancy is rare. Its incidence varies from 0.3% to 1.7% in women with previous scar and 0.03% to 0.08% in women with unscarred uterus. Diagnosis of placenta percreta at earlier weeks of gestation is difficult as a routine ultrasound at 18 weeks of gestation does not include detailed examination of localization and implantation of placenta. USG is definitive. However MRI can also be done. First trimester higher values of PAPP-A and free beta hCG MoM values can be related to placenta accreta in patients with placenta previa. In patients with severe hemorrhage and shock requiring hysterectomy, operative time and exposure to anesthesia are vital factors, and a quick subtotal hysterectomy should be resorted to. Rupture uterus is a life threatening obstetric emergency. These are non specific which makes diagnosis even more difficult. Delay in management can lead to significant morbidity and mortality. The high maternal morbidity, mortality and fetal mortality can be prevented through integrated efforts. Early antenatal care, early diagnosis of high risk cases, timely referral to a higher center, increased awareness of patients on birth spacing can prevent unwanted outcomes. Berghella V, Airoldi J, O'Neill AM, Einhorn K, Hoffman M. Misoprostol for second trimester pregnancy termination in women with prior caesarean: a systematic review. BJOG. 2009;116(9):1151-7. Kazandi M. Placenta percreta: report of two cases and review of the literature. Venkatesh KV, Harsha B. Uterine rupture at the fundus during pregnancy: a case report. Int J Reprod Contracept Obstet Gynaecol 2015;4(6):2072-3. Cunningham FG.Prior Cesarean Delivery. In Cunningham FG, Leveno KJ, Bloom SL, Spong CY, Dashe JS, Hoffman BL, et al. Williams Obstetrics. 24th ed. New York: McGraw-Hill Education. 2014; pg. 609.